The issue consists of three sections, each of which highlights a new phenomenon in the 21st century historical science. The first section, devoted to the issues of historical epistemology, is about the understanding of the historical time in the light of the concept of modes of historicity (T. Kondratieva), epistemological dimensions of transdisciplinary history emotions (Z. A. Chekantseva), estimation problem in the historical science on the material of the history of Russian conservatism in the late XIX century (T. Georgieva). The second section analyzes the most important innovations in the development of post-Soviet Russian historiography, including the formation of the transdisciplinary memorial paradigm and history of memory. Special attention is paid to the studies of cultural techniques of formation, transmission and actualization of the images of the past, problems of symbolic and discourse representation of social and historical experience, historical myths of national memory and history of historical culture. (L. P. Repina, O. B. Leontyeva). 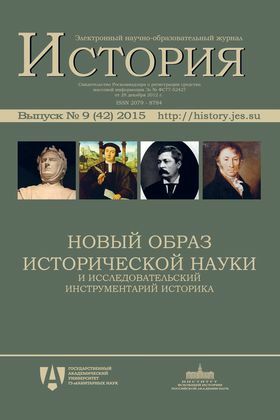 O. N. Mukhin, reflecting on the problems of interdisciplinary approach in the historiography, demonstrates the capabilities of the methodology developed in the Tomsk historiographical school on the material of the biography of Peter I. Two articles are devoted to concrete historical analysis of medieval texts in line with the history of emotions (L. V. Sofronova and A. V. Khazina, N. I. Devyataykina). O. Nagornaya investigates the system of higher education of East Germany students in the Soviet Union in 1950—1960 through the prism of the history of cross-cultural contacts and shows the lively nature of the transnational dimensions of the Eastern integration of that time. The third part deals with some aspects of the transformation of subject fields in the historiography. I. N. Ionov examines major shifts in the global dynamics of the content of history in the 1990—2010. O. V. Vorobieva highlights the institutional aspects of the history of emotions, in the form of research centers and research groups working on the principle of scientific laboratories. E. E. Savitsky, considering ways of historiographical representation of western geographical discoveries in their relation to the history of colonialism, reveals a gap in the criticism of the colonial forms of knowledge in the past and in the implementation of this criticism to modern practices in post-colonial and imperial studies. The article of A. A. Afanasyeva offers some observations concerning the current state of the “new history of medicine”, a field of research focused on the role of medicine, its ideas, ideologies and practices in culture and society. The interdisciplinary nature of the issue makes it useful not only for historians, but also for anyone interested in the state of contemporary historical knowledge.